Hana Hana Mi - Virtual Flower! 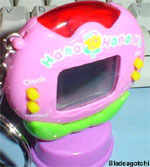 The Hana Hana Mi is a very unique virtual pet, the main reason being is that it is a Flower! 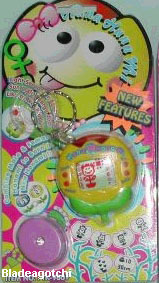 This has got to be the coolest keychain pet I have ever seen! It has real music and groovy sound effects, a light sensor and more! You have to feed the flower fertilizer, water it, spray it with insecticide when it gets bugs, trim it if it grows weeds, play music to it, play games with it, and you have to give it sunlight by holding the sensor on the top to a light source for a whole minute at a time. The game is to catch 20 bees. Val/Amy's Hana Hana Mi page (now with instructions! ).